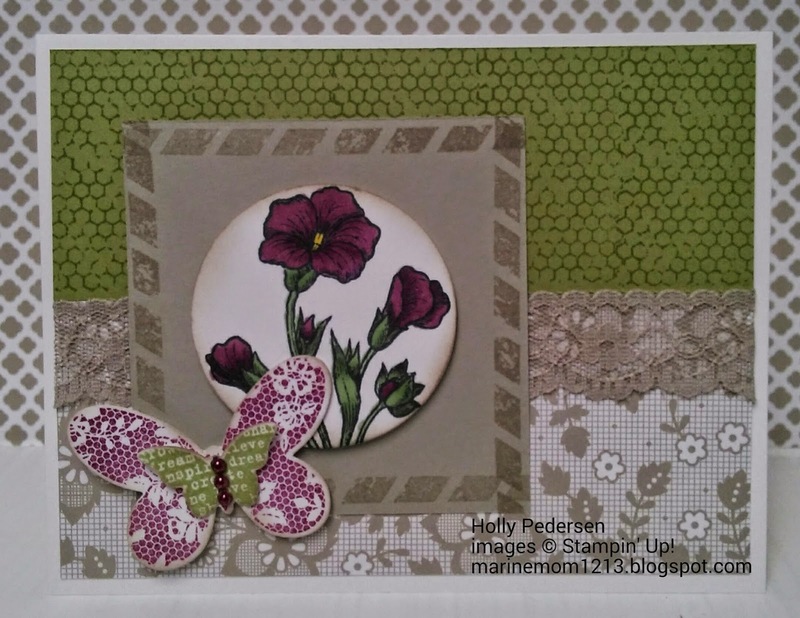 My share today is using the butterfly basics bundle in the Occasions catalog. Gosh, there are so many wonderful sets in the catalog, I want them all. This card starts out with a base of whisper white. Layered on top is a piece of pear pizzaz, stamped with the background stamp in this set with pear pizzaz ink. I then used a piece of Something Borrowed dsp for the bottom half of this layer. I covered the seam where I joined the papers with Sahara Sand 7/8" Lace Trim. The next layer is Sahara Sand stamped with the border line from the same set in Sahara Sand ink. For my flowers, I stamped them on whisper white with momento black ink and then used blendabilities makers to color them. The butterflies are images from the set as well. For the big butterfly, I used the coordinating framelit to cut it out. The little butterfly is punched with the bitty butterfly punch. I colored the pearls with the blendabilities makers as well to finish off my butterfly. Thanks for stopping by.